Comments by a former top U.S. transportation official in the aftermath of a fatal crash of an Amtrak train in Philadelphia have rekindled a debate: Would train passengers be safer if they were required to wear seatbelts? Ray LaHood, who was transportation secretary from 2009 to 2013, said Wednesday that the National Transportation Safety Board should consider seatbelts when it conducts its investigation into the crash and formulates its recommendations. LaHood added that when he was secretary, he recommended in the wake of several bus crashes that new passenger buses be fitted with seatbelts. Passengers on Train 188 described others being tossed around the train cars as the train derailed at high speed Tuesday night. One described chairs becoming unscrewed and suitcases flying around. Seven passengers were killed and more than 200 were treated for injuries. Herbert Cushing, Temple University Hospital’s chief medical officer, said Wednesday that nearly all of the 25 passengers treated at the hospital suffered rib injuries. “There were a lot of folks that got banged when they got rattled around,” he said. Surprisingly, Cushing said, only one patient had suffered a head injury. A 2007 study by Britain’s Rail Safety and Standards Board recommended against fitting train seats with seatbelts, concluding they wouldn’t necessarily reduce the number of serious injuries. The study found that while seat belts would reduce some injuries by keeping passengers from being tossed about, they would leave passengers vulnerable to “structural intrusion” such as objects penetrating windows during a derailment. “Crucially, restraining passengers in their seats would prevent passengers being thrown clear of structural intrusion and would be likely to lead to fatalities where current practice would likely have prevented them,” the report concluded. It also concluded that using seatbelts would require stiffer seats, which would reduce the seats’ ability to yield on impact, a key safety feature. 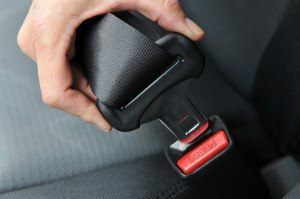 All 50 states have some form of seatbelt law for motorists, according to the Governors Highway Safety Association. Airlines require passengers to wear seatbelts during takeoffs and landings and during periods of turbulence. It isn’t clear whether Amtrak has considered seatbelts for passengers. An Amtrak spokesman didn’t immediately return a message seeking comment Wednesday.